corresponding to Saturday, the 19th of October, 1968.
a) Companionship in Allah, b) Love for His sake, c) Gathering for His remembrance, d) Yearning to know Him and e) Seeking the madad [assistance] of the Messenger of Allah. The aim of this is to clean the heart, purify the conscience, strengthen the inward and illuminate it with the light of Iman [faith/belief]. The eventual results of these aims are: establishing religious requirements, restoring morals and perfecting behaviour in all actions. For by perfecting the inward, the restoration of the outward is achieved naturally. Amongst the Hadiths of the Prophet: “Be aware that there is a morsel in the body; if it is restored, the whole body is restored, and if it is corrupted the entire body is corrupted; and this is the heart.” For this noble and unique aim, the sincere seeker in his quest [to Allah] is required to: a) Give over the whole matter [to Allah] b) Strengthen his determination, and c) Turn towards his Lord, with no regard for what Allah has chosen or reserved for him. Allah and His Angels are my witnesses that the day I came to my Sheikh and spiritual father, Sidi Abu Madian (رض†) neither a thought nor a whisper occurred in my mind or my heart that I would one day deserve to inherit his Sirr [Divine secret/wisdom/knowledge a Gnostic can attain], or to claim guidance after him. Instead, I came to him sincere in my quest [to Allah] and handed my soul over to him, so that he could guide me to know its reality and help me to get rid of the veils which stand between the slave and his Lord. How incomprehensibly difficult and complicated it is to get rid of the veils without sound spiritual teaching, wherein the sincere call [to Allah] and the sincere quest can be truly met! Despite the fact that I had been brought up in the lap of the Qadiri Tariqa of my fathers and forefathers, and particularly under the tutelage of my father [Sidi al-Moukhtar], who was known for his righteousness, it did not prevent me from renewing the determination and wishing to seek a [living] spiritual educator, as this is considered the sublime method of the path and Suluk (spiritual wayfaring) and Tadarruj (progress) in spiritual states. For I had an excellent example and good leadership from the past in my third great grandfather [Sidi Ali Boutchich], who followed exactly the same method, that despite growing up within the Tariqa, he too submitted himself to a contemporary spiritual teacher, who possessed a higher spiritual state. Eventually, at the hand of this Sheikh, Allah gave him of His bounty and success until he achieved the Idhn [authorization] in Al-Ismul-A’dham [The Greatest Name of Allah]. Hence, spiritual teaching was renewed at his hand and he was considered to be one of the great spiritual teachers of his time. 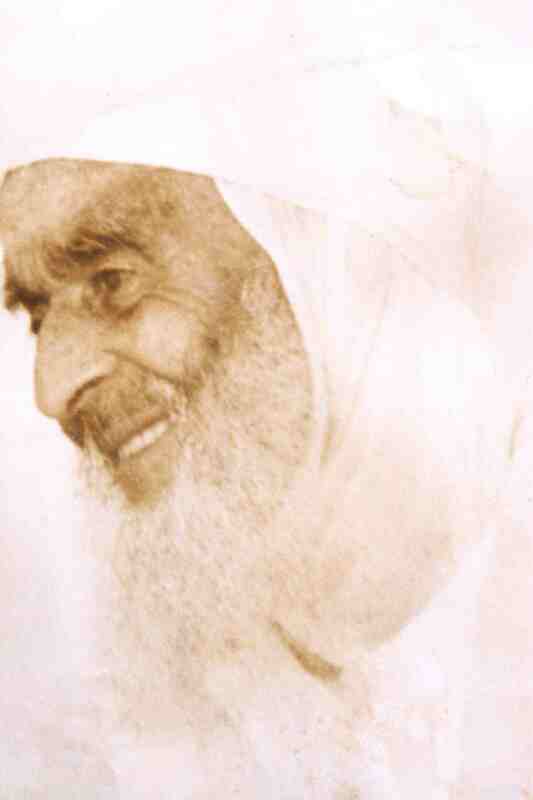 However, not long before his death, he commanded his son to refrain from [practising] Al-Ismul-A’dham, not to continue the Tarbiyyah, [spiritual teaching] and to return to the Tabarruk [traditional sufi practices by means of just seeking Baraka from the Thikr of either a dead Sheikh or a Sheikh with no sound spiritual Ithn]. This was because his son had not achieved the spiritual level [whereby he could be a spiritual teacher]. From this it is apparent that amongst the signs of spiritual teaching is attaining the Idhn [to be authorized to teach with and give the (disciples) as necessary] in Al-Ismul-A’dham with no restriction or limit. For in the old days, spiritual Sheikhs used to advise their disciples who had not attained this state, to seek after the death of their Sheikh, a Sheikh who attained this type of Idhn, so that they could continue to progress on their spiritual journey. Therefore, my advice to you is to connect with whoever comes after me, so that the nafs (ego/self) will not hinder your journey [to Allah]. For he who seeks his Lord with truthfulness and sincerity, seeks Him everywhere, and seeks help in knowing Him through those upon whom Allah has bestowed His grace. Yes, I kept company with Sidi Abu-Madian (رض†) with sincerity and truthfulness. My companionship with him was pure and devoid of any material gain. I found my heart and comfort in his presence because I loved him. Indeed, I loved him as I loved my father or even more. I can’t remember a single incident, ever, when I disobeyed him or ignored his instructions. Indeed he deserved to be obeyed and followed. His good character embodied humility, satisfaction and denial of worldly matters. His conduct was completely rooted in the Sunnah. He was known to everyone for his strict and extreme adherence to the Shari’a, so that he would get angry at the smallest contradiction or breaking of the Shari’a that was committed in his presence. He was deeply imbued in the essence of Allah, and would neither accept any neglect in the Deen (religion) by his disciples, nor the slightest misrepresentation of the character of the Messenger. My children and brothers in Allah, this is a small but complete portrait of my connection with my Sheikh and spiritual father Sidi Abu Madian (رض†). It illustrates to you the good and deep effect that his teaching has imprinted on my soul; and through which you will come to know everything about his life, character and conduct, and you have but to apply them, if you sincerely wish to attain goodness and spiritual perfection. Under its light, you will also embody the spiritual relationship and deep love which connected me to him. Yes indeed, I cannot hide from you the most important discussion that occurred between him and myself, in which he instructed me to resume his spiritual teaching after his death. After the stage of purifying the inward and cleansing it by way of Thikr of Allah, which the Book [of Allah] and the Sunna have recommended- he (رض†) used to teach those with pure spirits by means of Al-Ismul-A’dham. Indeed, he was (رض†) amongst those authorized in spiritual education and in Al-Ismul-A’dham without restriction or limit. This is considered a significant position which can be achieved only by those Gnostics of high [spiritual] station and khassatul-khassah (the Elect of the Elite) of His pious servants. How worthy it is for him [referring to Sidi Abu Madian] whose life was like this; holding fast to the Sunna and following the guidance of the Messenger and of his companions. He was indeed amongst those whom Allah has chosen for His Hadhra (Presence), supported with His aid and success, so that through him His bounty and guidance is channelled, religion is adjusted, crookedness is straightened and the Sunna is revived. As for the one who falls short of this station and is not qualified by the Decree of Allah to teach and guide His servants, it is better for him firstly to strive to guide himself and those who are under his care. Alas! The means of guidance to Allah by one human being to another human being is one of Allah’s hidden mysteries, which the human intellect still does not understand. Yes indeed, the most important discussion that occurred between us was that towards the end of his life he assigned me to carry on the responsibility which he had entrusted in me. I pleaded to be excused and pointed out those whom I thought more worthy and deserving, but he turned to me and said: “You will be in charge of it willingly or unwillingly.” So I just kept quiet out of respect. Eventually Sidi Abu-Madian (رض†) died in 1375H/1955AD and no one knew after his death who would succeed him, as my nature was inclined to silence and avoiding things! What preparation did I have to fulfil this duty? Yet, I was afraid of neglecting the responsibility and betraying the trust. What an enormous responsibility, especially with my feeble bones, weak body and old age! But what else could be done? Obviously I remained in my state of silence for about five years following Sidi Abu Madian’s death. For I could still not see myself worthy of being a spiritual teacher, nor feel the same confidence he had entrusted in me. On the contrary, I saw myself as the weakest of his pupils and the neediest of the bounty and mercy [of Allah]. But the matter rested in Allah’s Will, and the slave soon realizes that Allah’s Will is above his will and that a power other than his own is guiding him. Amongst the reasons that forced me to come forward and take on the duty which was assigned to me is that, in 1380H/1960AD, I was present in an assembly of Thikr, where I noticed something that happened in connection with spiritual teaching, which would not have happened if Sidi Abu Madian (رض†) had still been alive, or if the methods of spiritual teaching had continued after his death. Thus, I felt I was responsible for what was occurring in front of me in connection with spiritual education, and so I had to fulfil my duty. Otherwise, I would have been held responsible before Allah, if I had ignored or had not corrected it. Therefore, I agreed to give Ithn for the Thikr, including Al-Ismul-A’dham and finally announced the Wassiya (will) of Sidi Abu Madian (رض†), as he used to prompt me to do. And so, the matter became known and people from everywhere welcomed it. Out of Allah’s Mercy upon us and you, I did not proceed in this matter using the conventional methods employed by the Sheikhs of the past, whereby determination was strong, and hardship and isolation were used as means of defeating the nafs and removing its veils. Indeed, Allah knew our weaknesses and the multiplicity of our occupations in this era, so He inspired us, out of His kindness, to gather the whole matter in the Thikr and the perfection of worship; and that the Khalwa (spiritual retreat) of the believer is in his heart. For the Thikr of Allah in abundance, combined with establishing the rituals of the Deen, and observing the limits of the Shari’a, are sufficient to cleanse the heart, and defeat the oppression of the self and the removal of its veils. Without doubt this approach, which has sprung out of the core of the Sunnah, and is appropriate for the people of this time, was one of the reasons that people, despite their different status, have been able to benefit from this matter. This method of spiritual teaching was in fact based on the instruction of Sidi Abu Madian (رض†). He observed me once undergoing some hardship practices and striving beyond my capacity. Then he forbade me by saying: “We have entered through the door of Jalal [Hardship in Sufi terms in this context] and become weary, and you have entered through the door of Fadhl (Grace of Allah) and Jamal [Ease and comfort in Sufi terms in this context], so persist in this and do not go beyond it.” So it was. We discarded after him all methods of hardship and isolation, and have retained only the Thikr and the gatherings for its purpose. Thus, the matter became easy, and by the Grace of Allah it was only a short time after this call to Allah before the hearts of many lit up, especially those with good intentions and honoured aims who did not pollute it with base desires and worldly purposes. The Thikr of Allah and gatherings for its sake is not something new in Islam. It is rather something which the Qur’an points out in all circumstances and states. It is either by heart, by tongue or by reflecting and not neglecting [Allah]. The Almighty Allah said in the Qur-an: “Whoever turns away from the remembrance of the Beneficent [Allah], We assign to him a devil who becomes his companion.” And He said “And do not obey him whose heart We have made heedless of Our remembrance, and who follows his desires, so his case is abandoned.” He, Glory be to Him also said: “Verily in the creation of the Heavens and the Earth, and in the alternation of night and day, there are signs for people of hearts (cores), those who remember Allah standing, sitting and lying, and reflect on the creation of the Heavens and the Earth.” Again, He said:”Men who proclaim His Name morning and evening, not distracted by trade or commerce from the remembrance of Allah.” And He said again: “There is the best example for you in the Messenger of Allah, for those who want Allah, the last day and remembered Allah abundantly.” The Almighty also said: “Surely Allah and His Angels bless the Prophet (). Oh you who believe, bless him and give him the best of greetings.” The Hadith (Sayings of the Prophet) have also recommended the Thikr of Allah individually and collectively, silently and aloud. Our Master, the Messenger of Allah () has said in a Hadith Qudsi [sacred saying of the Prophet () but with the wording of Allah] that Allah says: “I reflect my slave’s regard for Me. If he remembers Me within himself, I remember him within Myself, and if he remembers Me in an assembly, I remember him in a better assembly.” He also said: “Oh people! There are detachments of Allah’s Angels who roam the earth and stop in gatherings of Thikr, so feast in the garden of Paradise. The Companions asked: And what is the garden of Paradise? The Messenger of Allah ()replied: “Gatherings of Thikr. So go back and forth in the Thikr of Allah.” Again he said: “Whenever there are people who are remembering Allah, the Angels surround them, the Mercy (of Allah) covers them, tranquillity descends upon them and Allah remembers them in the presence of those who are with Him.” And so forth. In another Hadith he described these readers by saying that the Qur’an does not pass their throats, i.e. it does not penetrate their hearts. May Allah preserve us and you from such deviation and innovation…..Amin. However, there are foundations and means to [spiritual] education. As for the foundations, as you know, they are first of all limited to adhering to the Book of Allah and to the Sunnah, establishing obligatory rituals, and not surpassing the limits of Shari’a of Halal (lawful) and Haram (unlawful). They are considered as the criteria for knowing righteousness from corruption. It is said: “Righteousness is better than [performing] miracles.” One of the Gnostics was asked: “What is the cause of some of your disciples drifting away from you?” He replied: “My heart is connected to the Shari’a and whoever violates the Shari’a disconnects from my heart.” For the principles of the Shari’a are easy and simple. Alhamdulillah (grace be to Allah). Its sources are recorded in the Book of Allah and the Sunnah of His Messenger (). Its rules are registered in the books of jurisprudence, and its effects are apparent in people’s actions, sayings and interactions. Indeed, the Shari’a of Allah is the best one can hold onto and the Sunnah of Rasulullah () is the best one can be guided with. The Almighty Allah says: “Whatever the Messenger brings you, take it, and whatever He forbids you, forego it.” The Prophet () also said: “I have left you on the white path; its nights [are as bright] as its days. Only someone doomed to perdition would deviate from it; [that is] the Book of Allah and the Sunnah of His Messenger. ()” Hence my advice will conform to these terms, just as Islam has recommended, and my council to you will be just as the Messenger’s. For no one, according to the Shari’a, is responsible for anyone else’s [actions] regarding breaking the law or committing a crime, apart from guiding, counselling and praying for him for guidance and good ending. For the whole creation will return to its Creator and its Controller. If He wills, He will forgive by His Bounty, and if He wills, He will punish. The best state of the believer is to purify his actions, and he should not see himself better in them than others, or believe that what he has is more secure than that of Allah. For only a loser would consider his actions in opposition to the bounty of Allah. “None feels secure against the devising of Allah except for those who are lost.” In the Hadith “The hearts of the slaves [of Allah] are between two fingers of the Most Merciful; He turns them as He wishes.” Also amongst the du’aa (supplication) of the Prophet (): “Oh Changer of hearts, stabilize my heart in Your Deen (religion).” And it is also said, “None tears off the livers of the Gnostics except the bad ending.” For neither a state nor knowledge would help people in what Allah has decreed in the Azal (pre-life). For what status would surpass the status of the Master of the Messengers, (Muhammad)? Yet he said to his daughter and apple of his eye: “By Allah, I would not be of any use to you in front of Allah, oh Fatima.” He said about himself to his companions: “By Allah, I don’t know what Allah will do with me or you on the Day of Reckoning unless He enfolds me in His Mercy.” Perhaps this was also what made Seyyiduna Omar (رض†) say:”If only the mother of Omar had not given birth to Omar, then he would not have seen this world and would not have seen Al-bashar (mankind). As for the ways and methods of spiritual teaching for those who have good intentions and honoured aims, and who believed in the vitality they sought, they are limited in the Thikr [of Allah] and gathering for its sake. Indeed we have advised you abundantly about this, for what it contains of purity of the heart and the guarantee of its survival and cure. For what cure other than the Thikr would illuminate a heart whose sides are darkened and its mirror rusted? What remedy other than the Thikr could return to the inward its clarity and stability? It has been related: “To everything there’s a polish and the polish of the hearts is Thikr-Allah.” The beneficial Thikr, however, which effects the soul, moves emotions and feelings, gives the believer a wholesome and new life, and teaches him meaningful education, is the Thikr of the heart which is free from all worldly aims; the Thikr that is far from the professional type which involves the use of Allah’s Names for specific evil reasons and so on, [such as black magic, possession of spiritual creatures, harming people, increase of wealth], which certainly does not suit the states of the sincere and Truthful. The Almighty Allah says: “Is he who was dead and We brought him to life and set for him a light by which he walks among people, the same as someone who is in utter darkness from which he is unable to emerge?” Therefore, when the Thikr is from a pure heart that is lit by the light of Iman, most certainly Shaytan departs from his path. The eventual results of this kind of Thikr will be the Asrar and Anwar [secrets and lights of spiritual nature], which will touch the heart of the believer, and will sometimes be manifested in shapes of light. Their only goal is to encourage the Murid (spiritual wayfarer) to continue his spiritual journey, whereby righteousness is achieved and the yearning to know Allah is increased. However, the one who grounds himself in worldly matters and for whom the realm of spirituality is beyond his capacity should not be troubled by those manifestations. It has been related: “Speak to people according to their understanding. Do you want Allah and His Messenger ( ) to be disbelieved?” The sensible Murid should be courteous about these manifestations when they occur, conceal any sign and not be deluded by them. At the same time, the Murid must control and contain those states as much as possible, so that it would not take him out of the limits of acceptable common behaviour, particularly in religious contexts. It is an indication of perfect sincerity that outward emotions are in harmony with inward emotions. This is indeed what made the [spiritual] teachings of Sidi Abu Madian (رض†) incomparably the best. He rejected all outward emotions which had no inward reality, and the Hadra (dance of Divine Presence) is only permitted to the one for whom the situation has gone beyond his control, and for whom the Shawq (yearning for Allah) has become stronger upon hearing the Thikr and recitation of the Qur’an. In this case, he will be left to himself until he returns to his normal state. When this occurs, the Murid is left to his state until his inward settles down. However, what Allah grants a servant for His remembrance and what a servant invents for himself is clear in this matter. Beware that Shaytan wants to separate you from the tradition of the good doers and the Truthful. It has been proved through the trials of the people of Allah that the sincere call to Allah will remove dirt as the fire removes rust from iron. The Will of Allah has confirmed that only those with strong determination and pure intention will benefit from its secrets and be firmly established in its Haqiqa (Divine reality). Those are the ones who desire primarily nothing but to straighten the self and strive to know its reality. It is not appropriate for anyone that the Thikr of Allah should stand between him and the requirement of the Shari’a, or that someone would give up work and earning a living and use the call to Allah as a livelihood. Let everyone of you do what Allah has destined for him with honesty and sincerity. Let everyone of you have awareness and fear of Allah instead of the creation. Let everyone of you trust in Allah’s support and help in order to overcome both religious and worldly matters. Certainly Allah loves the faithful slave who earns his living by his hand, and loves even more those whose words correspond with their actions. Fill your spare time with the Thikr of Allah, and gather for His sake after completing your worldly occupations. That is evident in the Hadith: “Engage in the Dunya (material world) as if you will live forever and engage in [preparing for] the Akhira (Hereafter) as if you will die tomorrow.” My children and my brothers in Allah, reflect on these words and act upon them in order to have insight in this matter, and we ask Him, the Almighty, to inspire us to good, to guide us on the straight path, and to make us and all Muslims successful in achieving happiness. He is indeed the All-Hearer, the Answerer and the All-Knowing. Dictated by Sidi Al-Hajj Al-Abbas Al-Qadiri Al-Boudshishi, May Allah be well pleased with him, to the Faqir Sidi Al-Hajj Yahya Al-Atighi in Madagh, Morocco, on Saturday the 26th of Rajab, 1388 Hijra, 19th October 1968. Translated by the needy to His Lord’s mercy Al-Faqir abbas wahbi with the help of Lalla Bashira Goodnews.